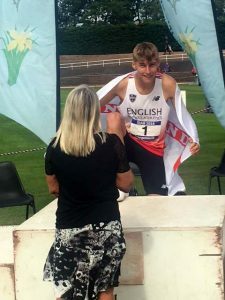 Sam Brereton (Wadebridge) soared to yet another win & county record taking the Inter Boys high jump at the All England Schools Athletics Championships held in Birmingham on Friday and Saturday 13th & 14th July. His leap of 2.04m also means that he will now compete for England Schools in the International in Edinburgh, Scotland this coming Saturday. 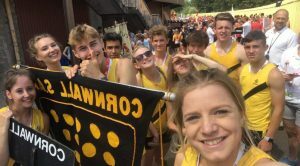 Cornwall had a good Championships with a further 6 athletes making the top 10. 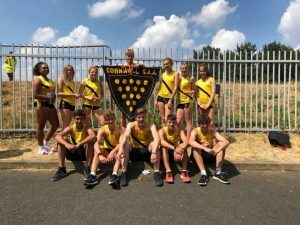 Finn Birnie (Truro) 6th in senior boys 3000m with a new county record erasing one set back in 1992, Harry Gurr (Penryn) 7th junior boys 200m, Grace Brock (Truro & Penwith Coll) 6th senior girls 3000m, Lucy Hughes (Helston) 5th junior girls pole vault, Milli Yoki (Truro) 10th junior girls discus & Harris Mier (Truro) 10th inter boys 1500m. Senior Boys. 3000m 6. F.Birnie 8.33.59 CR, ES pb. 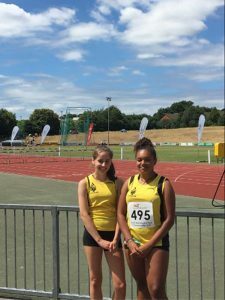 200m Kaya Cairney (Truro & Penwith Coll) s/f 22.44 ht 22.38. Inter Boys. High Jump 1. S.Brereton 2.04m. CR, NS. 1500m 10. Harris Mier 4.06.77 ht 4.01..8 NS. Junior Boys. 200m 7.H.Gurr 23.43 s/f 23.31 pb, ht 23.47 all ES. 100m M.Tao (H.Davy) ht 11.91. 80m Hurdles H.Curtis (Saltash) ht 11.89 eq pb ES. Senior Girls. 400m Hurdles M.Mather (Torpoint) ht 70.13. J.Bytheway (Callington) ht 66.51pb. 200m H.Smith (Truro & Penwith Coll) ht 26.08. 800m I.Wood (Truro & Penwith Coll) ht 4.42.49 pb ES. 3000m 6.G.Brock 9.53.17 NS. Junior Girls. Pole Vault 5.L.Hughes 2.75 ES. Discus 10. M.Yoki 28.94 pb ES. ES Entry Standard. NS National Standard. pb Personal Best. 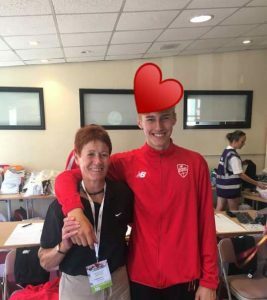 Sam Brereton wins gold in the High Jump with a jump of 2.04m; …..
….. and celebrates with Team Manager Mo Pearson afterwards!